I was SO excited to come across this book AND to be given the opportunity to give one copy away to one of my readers. Thank you to the publisher for doing this with me! I took a break from my Year of Mysterious Giveaways last month due to feeling very tired, sick, overwhelmed and crazy after my trip to NYC and BEA. This is a PERFECT book to come back with. You don't just get ONE new mystery author, you get 26! How cool is that? Check out this description from the publisher's website and also click on the title above and it will take you to the official book page. Alexander McCall Smith. Sandra Brown. Faye Kellerman. J.A. Jance. Jeffery Deaver. Kathy Reichs. Lisa Scottoline. 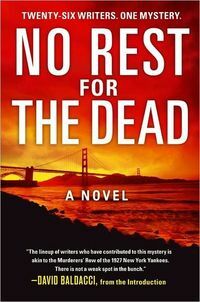 Jeff Lindsay.These are only a handful of the names that make up the all-star lineup of authors behind No Rest for the Dead, a tale of vengeance, greed, and love that flows seamlessly, in the words of David Baldacci, "as it passes from one creator's mind to the next." There is always that case, the one that keeps me awake at night, the one that got away. It'll always be there, gnawing at the edges of my mind. It doesn't matter that ten years have passed, it doesn't matter that the case is officially closed. An innocent woman was executed, I was the one who helped make it happen, and on the sad night when the needle was inserted into her arm, injecting her with death, part of my life ended too. It never felt right, never made sense. Sure, there was motive and opportunity, there was the physical evidence. But if you met her, if you knew her the way I got to know her . . . It wasn't until later, after I'd taken a step back from the case, that I realized it had angles I hadn't seen, layers I hadn't uncovered, back when it mattered, back when I could have saved her…. Please reside in the United States and/or Canada. The book will be sent directly from the publisher. This sounds like a very interesting concept to have so many authors colloborating. How cool is this!? Count me in, please! Thanks so much for the opportunity. I so want this one. This sounds awesome! Pick me, Pick me!! This sounds interesting. Count me in! This book sounds really good. I think I found a book that both my DH and I would both read. Well, I managed not to miss this one! It sounds like a good read. Thanks for the chance!